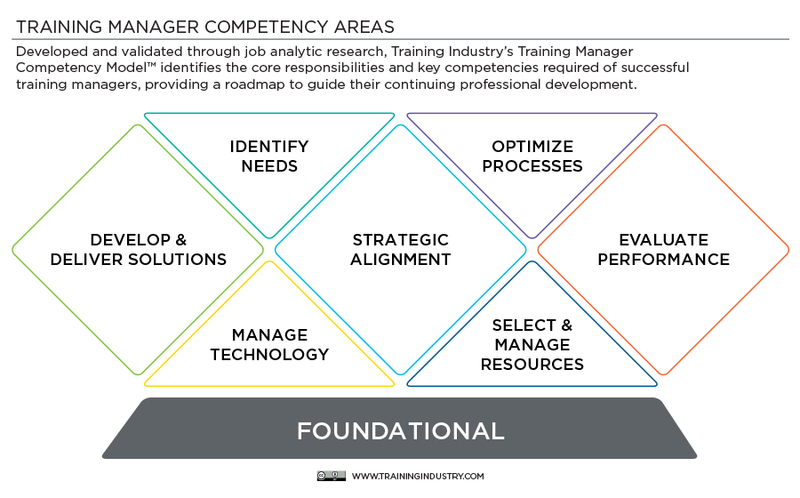 The Training Manager Competency Model™ is a tool training managers can use for their professional development and to support the development of a high-performing training organization at their company. It grew out of Training Industry, Inc.’s Great Training Organization research and was developed and validated through job analytic research. The model identifies the seven core responsibilities and foundational leadership responsibilities essential to successful training management. Within each responsibility are competencies that training managers need to successfully perform the responsibility. The first core responsibility of a training manager is strategic alignment of the training function with the organization’s goals and objectives and obtaining stakeholder support for imperative training initiatives. Influencing/negotiating is the ability to persuade, build consensus and gain cooperation to obtain information and accomplish goals. Strategic thinking is the ability to understand organizational goals, formulate objectives, determine priorities, adopt a short- and long-term view, and recognize opportunities to accomplish training objectives. The second core responsibility is evaluate performance to determine whether training is meeting business needs and improving organizational performance. Performance measurement is the ability to apply the principles and methods for evaluating program or organizational performance using financial and nonfinancial measures, including identifying evaluation factors, metrics and outcomes. Organizational performance analysis is the ability to apply the methods, techniques and tools used to analyze program and organizational performance and deliver key performance information used to inform decisions, actions, communications and accountability systems. The third core responsibility is develop and deliver learning solutions that meet business needs using needs assessments and evaluative information. This responsibility requires competency in employee development, the ability to apply concepts, principles and practices related to planning, evaluating and administering training, organizational development and career development initiatives, as well as creativity and innovation. The fourth core responsibility is optimize processes associated with running a training organization. Critical thinking is the ability to use logic and reasoning to identify the strengths and weaknesses of various solutions, conclusions or approaches to problems. Problem-solving is the ability to identify problems, determine the accuracy and relevance of information, use sound judgment to generate and evaluate alternatives, and make recommendations. The fifth core responsibility is select and manage resources, including the employees, materials and vendors, involved in developing and delivering learning initiatives. Decision-making is the ability to make good, well-informed and objective decisions; perceive the impact and implications of those decisions; and, even in uncertain situations, commit to actions that will accomplish organizational goals. Management of personnel resources is the ability to plan, distribute and monitor work assignments, including identifying the best people for specific tasks; evaluate and provide feedback on work performance; and motivate, develop, coach and direct people as they work. The sixth core responsibility is identify needs. This responsibility involves performing an analysis to understand the organization’s problems. Information management and organization is the ability to identify, gather, organize, maintain, and determine the importance and accuracy of information. Consultation is the ability to identify and provide guidance to stakeholders by listening to their needs and identifying processes to address them. The final core responsibility is manage technology and technical personnel required for creating, managing and delivering training. This responsibility requires competency in human factors, the ability to apply the principles, methods and tools used to identify and apply information about human behavior, abilities and limitations to the design of tools, machines, systems, tasks, jobs and environments for effective human use, and competency in the application of learning technologies. ”Training Manager Competency Model” is a trademark of Training Industry, Inc. It is the foundation of the organization’s Continuing Professional Development programs, which were specifically designed to develop these key competencies of a training manager.